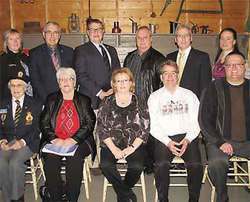 The eleven major sponsors whose contributions in funding or in-kind contributions, equal $1000 or more each to the Leaders of Tomorrow Awards program, were represented this year by (left to right, back row) Lee Parkin from Manluk Industries, City of Wetaskiwin Mayor Bill Elliot, Saint Thomas Aquinas Roman Catholic School Division Trustee Kevin Booth, Wetaskiwin Regional Public School Division Trustee George Ollenberger, Reynolds-Alberta Museum Director Noel Ratch, Jessica Patten from 4-H, (front row) Royal Canadian Legion Branch # 86 Wetaskiwin 1st Vice President Kay Grinde, Town of Millet Councillor Carol Sadoroszney, County of Wetaskiwin Reeve Cathy Rooyakkers, Tim Robson from the Rotary Club of Wetaskiwin, and Robert Camp from the Wetaskiwin Credit Union. The numbers have not changed; most of our kids are good kids. There are 11 Major Sponsors who support the Leaders of Tomorrow Awards program "recognizing youth who have made outstanding contributions to their community through volunteering," and a number of other community donors and contributors. The Leaders of Tomorrow Awards program could not exist without this community support, and the annual Kick Off is held each January to recognize and thank all who do so much to support this program that recognizes some of our outstanding good kids. The annual Kick Off also serves to announce the availability of the forms to nominate the youth who lead by example in volunteering in both novel and traditional ways. This year, nomination forms are available in all the usual places: by direct mailing, at the City of Wetaskiwin FCSS office, the County of Wetaskiwin office, The Town of Millet office, the Wetaskiwin Regional Public Schools Administration office, at Sacred Heart School, and can be printed off from a link on the City of Wetaskiwin website www.wetaskiwin.ca/leaders. Any individual or organization may nominate any young volunteer ages 6 to 21 for recognition of their leadership qualities in volunteer service. Nomination forms must be submitted by 4:30 p.m. on Thursday, February 20th. For additional information about submitting a nomination, contact Lynn Croft at 780-352-6018. The young volunteers nominated are recognized in four age-group categories: 6-11 years of age, 12-14 years of age, 15-17 years of age, and 18-21 years of age. All nominees receive recognition at the Awards Night ceremony where their biographies are read and they receive a T-shirt and certificate etc. All nominees also attend a 4-H Leadership Camp weekend at the Battle Lake 4-H facility. A representative is chosen from each age group to receive an additional trophy and a $100 cheque to give to the charity of their choice. The 2014 Leaders of Tomorrow Awards Night will be held on Monday, April 7th. It will be the 19th Annual Awards Night. As a community, we are fortunate to have a Leaders of Tomorrow program that is considered a model. Not only are the Major Sponsors and other community donors and contributors worthy of our appreciation, but also the many individuals who have volunteered so much of their time and expertise to organize and carry out the program.